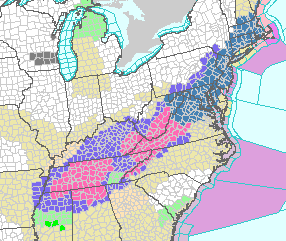 Pink = winter storm warning. Blue = winter weather advisory. Dark green = winter storm watch. My snow path forecast and probabilities (see posting below) remain unchanged. Note: If you are planning on flying through these areas you will want to read the Airline Crisis Survival Guide.